In a small skillet, combine the white wine, lemon juice, and shallot. Bring to a simmer and reduce until the mixture yields about 2 tablespoons, about 7 minutes. Remove from the heat and whisk in 6 pieces of butter. Return the pan to the lowest heat setting. Continue whisking and adding butter a few pieces at a time, allowing each addition to fully melt before the next. Whisk to combine. Keep Warm. Season salmon with salt and pepper on all sides. Pat the seasoning into fish. In a large sauté pan, heat olive oil over medium heat. Add salmon, cook until browned, then flip over to brown the other sides. Remove from pan and place on paper towels to absorb excess oil. 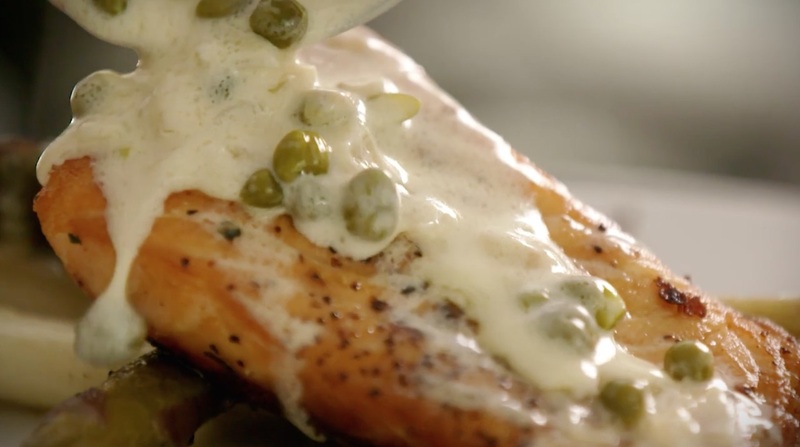 Serve by spooning the sauce over the salmon.